Lake Tahoe has been a frequent vacation spot for us since my wife and I spent our fourth of July weekend there in 2005. We have been going there at least once every two years ever since. 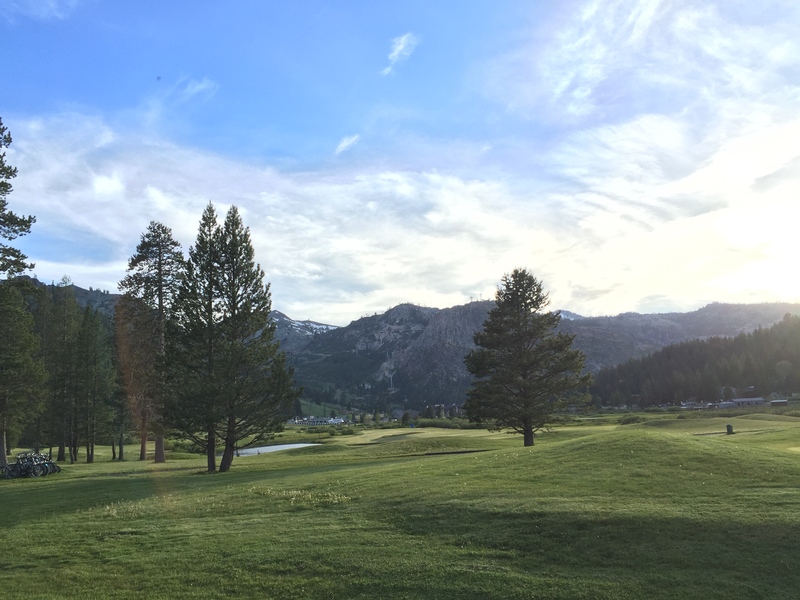 Like most people who visit this natural wonder, we are drawn to the beautiful, turquoise waters of Emerald Bay and Sand Harbor, and especially the alpine scenery of Squaw Valley, the site of the 1960 Winter Olympic Games. 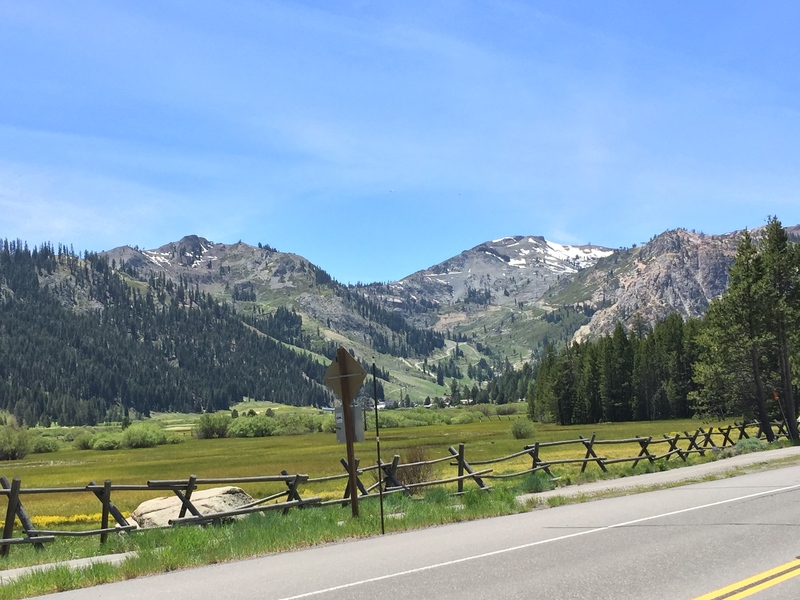 My 8-year old daughter at the time was amazed at how the wide open pastures and the granite mountains of Squaw Valley remind her of the beautiful scenes from The Sound of Music. We have a fond connection with both this place and the film, and hopefully one day we will travel to Salzburg and see the Austrian Alps for ourselves. 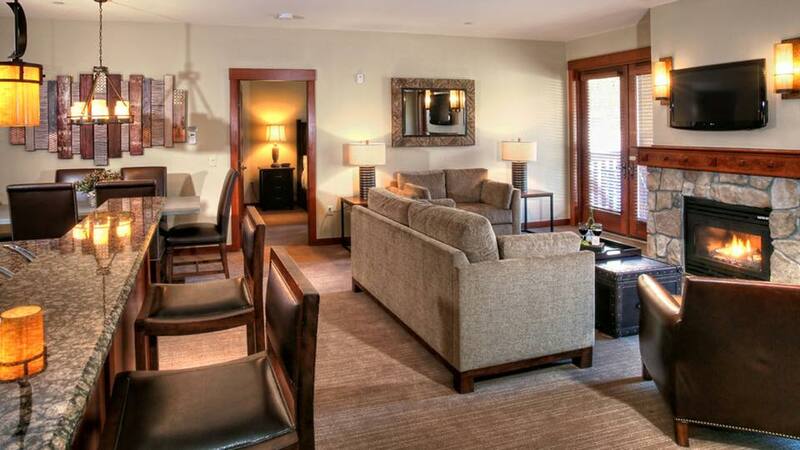 We spent this past weekend at Squaw with our good friends from LA. Now at age 9, my daughter enjoyed the trip this time around even more, because her friends were there. 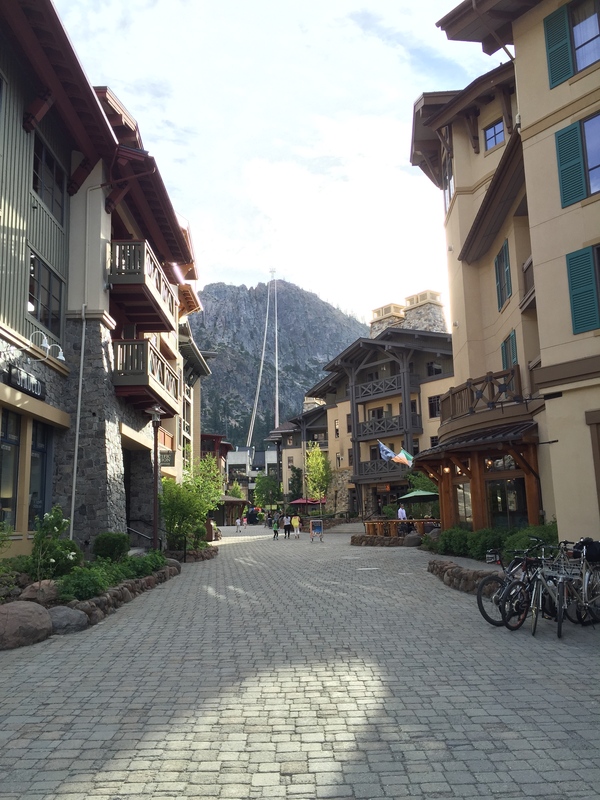 We stayed at a 2-bedroom condo at the Squaw Valley Village where we were surrounded by the tram plaza below and distant views of Squaw Peak- nearly 2,700 feet above the valley floor (8,900′ above sea level). 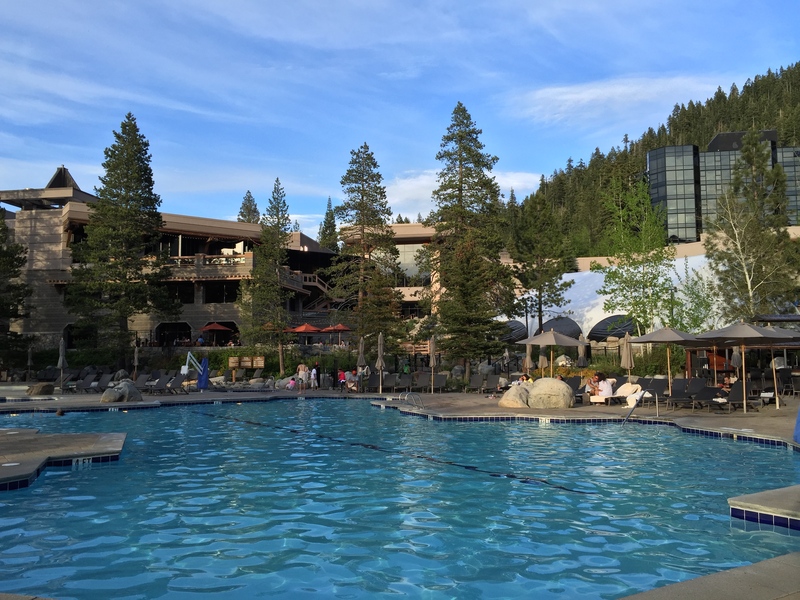 It was their first time visiting Squaw Valley so we showed them around the village shops and restaurants as well as the beautifully located Squaw Creek Resort nearby. The aerial tram tickets up to High Camp were so expensive that we opted to hike up Shirley Canyon trail instead. 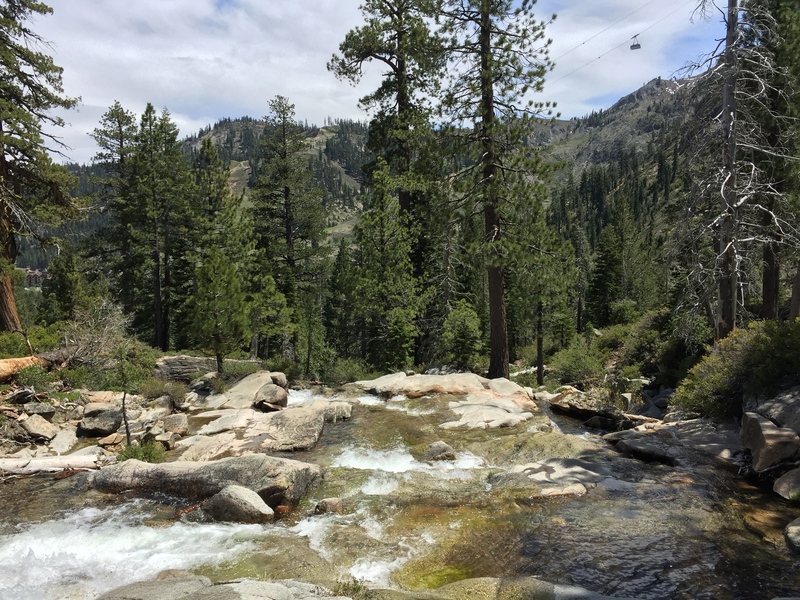 Granted our friends would be missing out on their first-time experience of the aerial tram, we decided that we would reward ourselves with the beautiful views of the valley below and enjoy the roaring waterfalls along the trail. 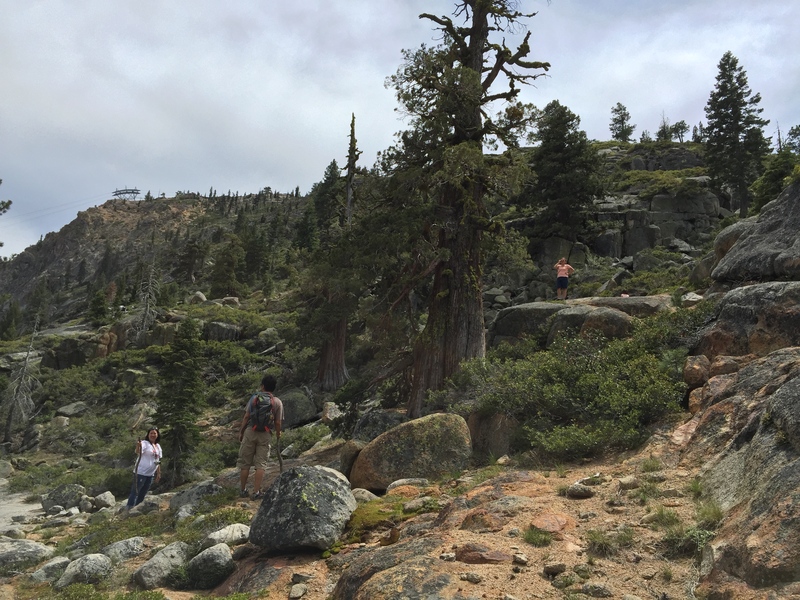 We hiked up to a series of flat, granite plateaus at the edge of the waterfall and plunged our feet into the icy, cold water. In a time when we are constantly checking our emails, seeing the latest updates on Facebook and Twitter, etc., it was nice not to pull out our iPhones and Androids except only to take photos and videos of what was going on around us. 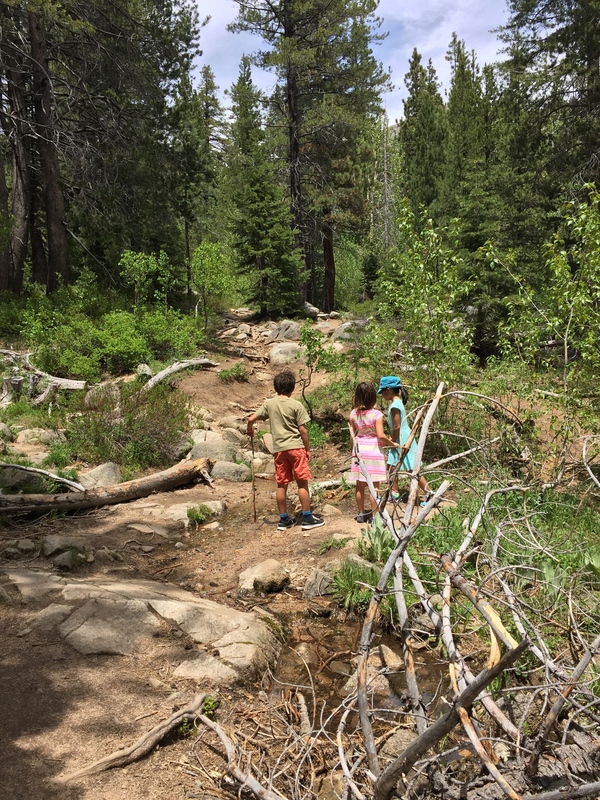 My daughter and her friends ambled cautiously over the rocks by the rushing stream to observe water bugs and tadpoles while the rest of us laid down on the hard granite rock and soaked in the view from afar. As we were drying off our feet, I was looking up at all the conifer trees around us and thought about how humans have only been around for a blip in time when compared to the lifespan of giant Redwoods and Sequoias. Imagine how long ago it was when the first streams fed through this canyon, carving away granite boulders, twisting and turning their way down to Squaw Creek, and then connecting with Truckee River, the only outlet of Lake Tahoe, and eventually emptying into Pyramid Lake in the Great Basin of Nevada. Many years ago, I was surprised to find out some interesting facts about Lake Tahoe. It is the second deepest lake in the United States with a depth of 1,645 feet. It has about 72 miles of coastline with a distance of 22 miles long at its longest and 12 miles across at its widest, nearly the same size of the SF Bay. Interestingly, there are 63 tributaries that feed into the 39 trillion gallon lake and only one outlet as previously mentioned. If the lake was drained entirely, it would take 700 years to fill it up with precipitation, runoff and snow melt. 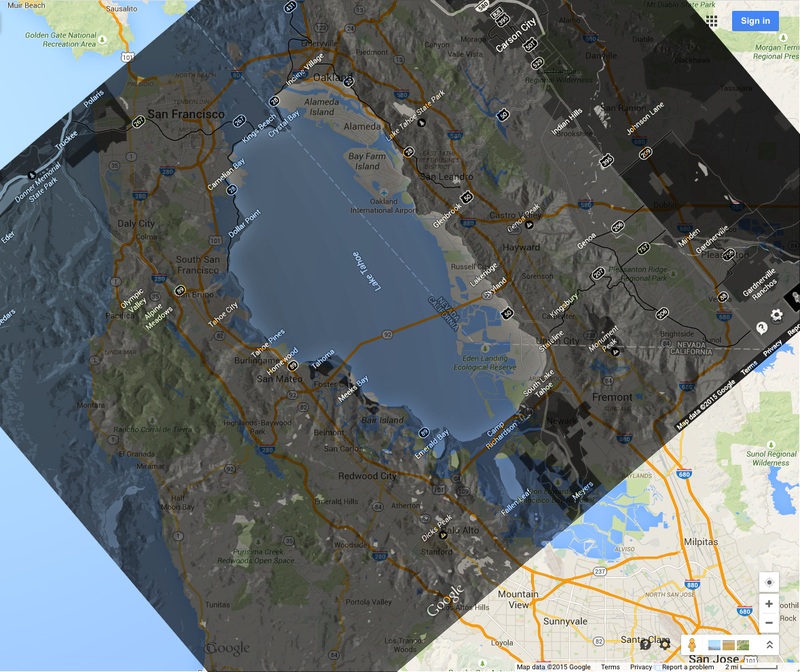 Even more interesting, if the lake was drained into an area the size of California, the water would be 14″ deep! We continued up the trail, despite some resignation from the little ones, but they trudged onward with the expectation of ice cream later. Surprisingly, that wasn’t their only motivation. As we climbed out of the forest, we could see the mountain before us. They scrambled up the steep, rocky slope while we picked up the pace to catch up with them. It was not too long before one of them gave up and broke down in tears when she lost her footing and scraped her leg. Thankfully, it wasn’t serious and I realize now that we should have turned around sooner. Nonetheless, we are so proud of them for having made the 3 1/2 mile long trek. 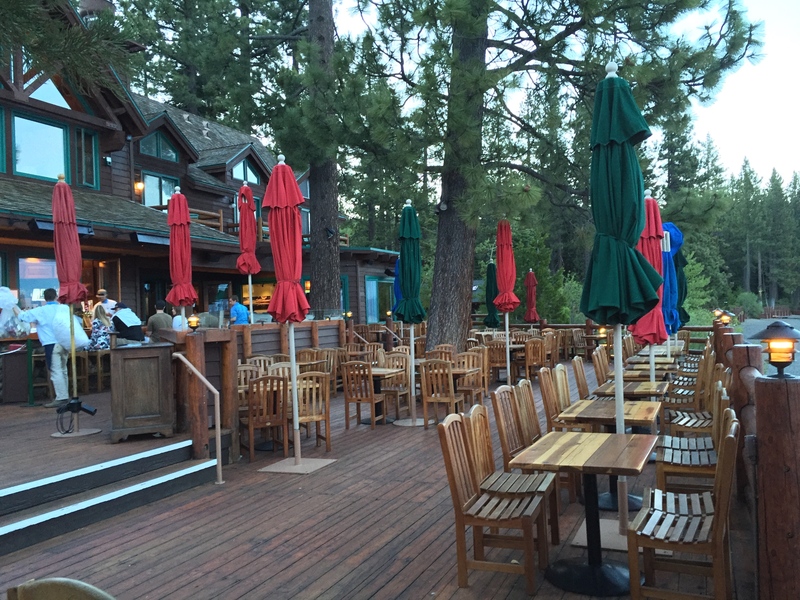 That evening, we ate dinner at the picturesque Sunnyside Restaurant on the lake in Tahoe City. The sun was setting and the sky had a purplish tinge. 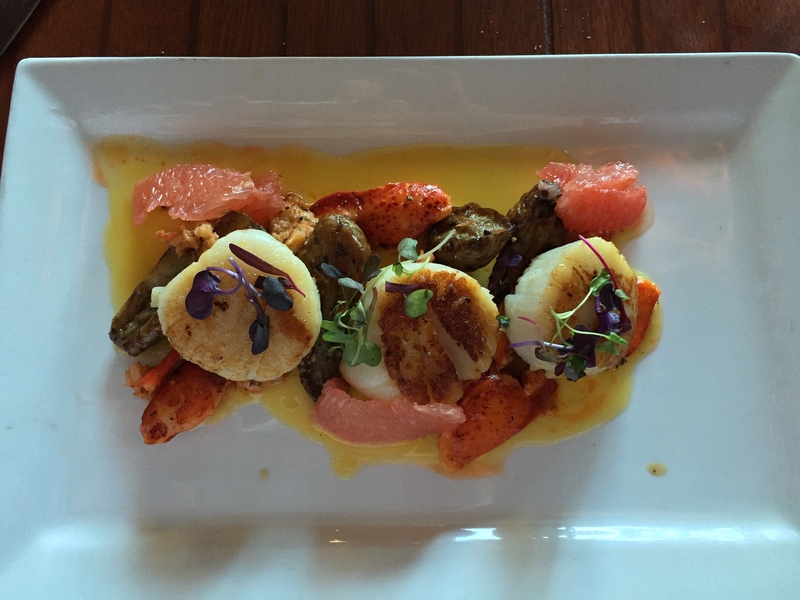 Two of the memorable dishes were the Durham Ranch Elk Strip Loin served with potato rosemary gratin, arugula, Sonoma goat cheese, hazelnuts, and cherry compote, and the Seared Nantucket Scallops with roasted lobster, sun chokes, ruby grapefruit, pomegranate, and passion fruit butter sauce. It was the perfect setting to celebrate the end of our quick weekend getaway. 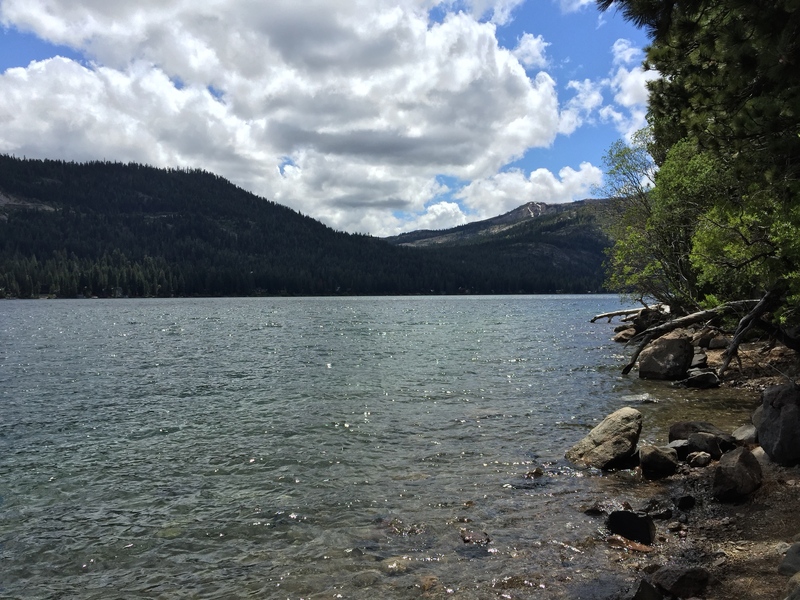 On our last day, we stopped at Donner Lake since the kids wanted to go fishing, or should I say, attempt fishing. Despite the wind and the cold, we did enjoy the scenery, and the sun managed to peek out from behind the clouds. But between the wind and the lack of patience, we decided it was time to head back home. When we did get back, my daughter felt a little nostalgic, because the trip went by so quickly. She missed her friends as well as our home away from home.